Gtalk is one of the best chatting application ever made in the Internet History. I always love Google Talk for its simplicity. Nearly all my friends use Google Talk, and it always stays open in my systray. 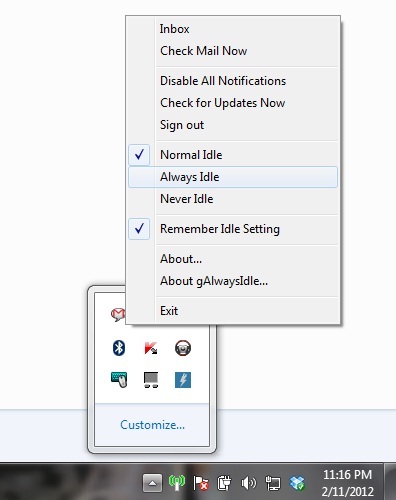 But one thing I don’t like about GTalk is that it doesn’t let me set my status message as idle.Because Google Talk is an extremely honest application and will show you “idle” only if you do not use the computer for at least 10 minutes. Now imagine a scenario where you are logged into Google Talk but don’t want friends to know about your online status. gAlwaysIdle is the tool which will help you to set your status always idle on Gtalk.